Ordinarily Suicide Squad intersecting with the Superman titles would be pretty significant, and indeed Rob Williams's Rebirth Suicide Squad Vol. 4: Earthlings on Fire's premise holds a lot of promise. But the story does not come close to the suspense and intrigue of the previous volume, as Williams seems to return to his formulaic "bottle episode" approach to Squad, emphasizing action over plot. Earthings appears in some respects to be an interstitial "down" trade between two peaks; let's hope that's the case and that next time around, Williams can demonstrate again the promise he's shown this title can hold. It's an impressive feat of coordination that for almost twenty issues now this title has held on to Zod seemingly just for the purpose of transferring him over to Action Comics. Zod's presence has given Suicide Squad some much-needed cache, though in some respects it feels surface-level; having gained possession of Zod, the Squad barely got to use him and did not accomplish Amanda Waller's goal of confronting the mysterious "People" with him. It's good that Williams seems to be finally getting down to the People with the next volume; to an extent Zod is a symbol of this book mainly biding its time to this point without a great amount in terms of plot or character development to show for it. The difficulty with Earthlings is that it buries its biggest moments. I might have said the first two chapters of this book, issues #16-17, belonged at the end of Suicide Squad Vol. 3: Burning Down the House, except that book's about as perfect and complete as they come; rather simply the face off between Waller and her subordinate (and People spy) Harcourt should have come more toward the end of this book and not in the second chapter. As it stands, Williams puts the emphasis on Zod, whose rebellion and escape changes the title almost not at all, and not on Harcourt's death, which ties into the emotional center of the book and the question of who on the team is a traitor. With this book's final chapter, Waller names Harley Quinn the leader of the Squad in Rick Flag's new absence. That's a clearly ridiculous move, but it's not worth necessarily unpacking since, this being Suicide Squad, it's entirely possible this is another one of Waller's plans within plans. Though again it's questionable whether this character is even recognizable as Harley Quinn any more, the Harley/Rick romance has grown on me (see also whether we can recognize this as Rick Flag), and it's plenty poignant when the Squad has to let a prison-full of meta-humans die and then Harley and Rick "commiserate." Equally Williams uses this arc well in that, in the absence of Rick, Harley is reverting to a Joker-ized state, but there again, making her leader seems deference more to fiat than sense, unless it's a ruse. Earthlings would seem to bill Tony Daniel as the book's new artist, though the book's first three chapters are all he does. Daniel's work is for the most part quite fine here, and fitting given that he first drew this latest version of Zod back in Superman/Wonder Woman; only his Captain Boomerang is strangely spindly. The switch to Neil Edwards in the main story's fourth part is unfortunate because it's so noticeable, and also I think Edwards draws Waller as more emotional than Williams intends, making it seem at parts that Waller is uncharacteristically panicking. None of it approaches John Romita and Eddy Barrows from last time. I did enjoy the guest stint by Stjepan Sejic (though his style is assuredly better suited for Aquaman) and especially the cover by new favorite Otto Schmidt from Green Arrow. 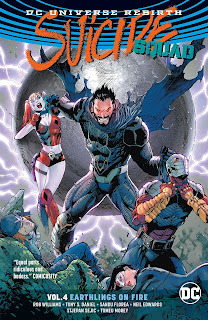 This book's variant covers did seem unusually rough; Lee Bermejo's Lex Luthor/Harley Quinn take on a classic Harley image is great, but Whilce Portacio draws the heat vision of Zod and the Cyborg Superman as weird straight lines, and his cover to Suicide Squad #20 seems a hastily-drawn Harley Quinn with disproportionate features. Again I'm reminded that Rob Williams's Suicide Squad Vol. 3: Burning Down the House was a really crackshot book, really up there with modern Suicide Squad's best, and Suicide Squad Vol. 4: Earthlings on Fire just doesn't measure up. The jury's out at this point whether the third volume was a fluke; I guess the fifth volume will be the one to tell the tale.